Ok, so mixed results from last year’s lentils. Could be because I didn’t eat the lentils on New Year’s Day itself. This year, however, I was determined to do all I could to ensure a luck-filled year. And since the tarot card reader Celtic Cricket had informed me that I was in for some tough going in the early months, it was important that I make a strong culinary choice on New Year’s Day. What to do? 12 grapes at midnight, one for each month of the year, like the Spaniards? Or should I go with the Danes and serve myself up a nice dish of stewed kale sprinkled with sugar and cinnamon? Perhaps a little mashed sweet potato with chestnut, some simmered burdock root, a spoonful of sweet black beans, and some fish cakes – a few of the components of the Japanese osechi-ryori would be the way to go. But the decision was made when I received an invitation from a close friend to attend his family’s annual pork and sauerkraut party. Though of Italian descent himself, his wife hails from western Pennsylvania, where New Year’s Day pork and sauerkraut eating is a given. Though some Pennsylvanians declare there to be no reasoning behind it, it’s simply the thing that you do, a number of sources claim that pigs root forward to look for food, and therefore the eating of pork symbolizes forward movement into the future. Pigs are apparently also symbolic of prosperity and wealth. 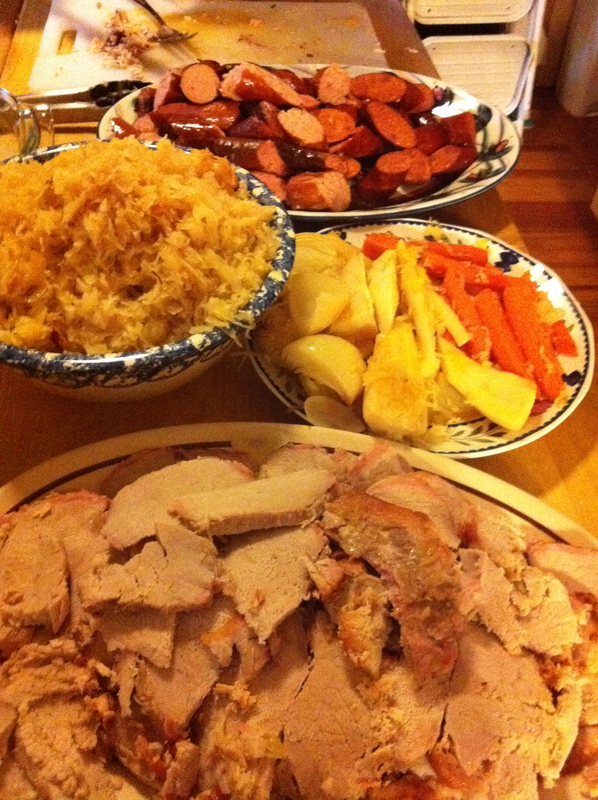 And so I welcomed 2012 with a plate of roast pork, sauerkraut, and linguiça (a nod to my friend’s love of New Bedford’s Portuguese restaurants). How about we touch base in mid-year to see how the luck is going? Interesting New Year’s Day meals. I’ll take the pork also. i do hope that 2012 is the best year yet for you.